One of Shakespeare's most popular comedies is reimagined on the Royal Shakespeare Theatre's stage in Christopher Luscombe's charming production of Twelfth Night, which sees twins Sebastian and Viola shipwrecked in England in the late 19th century. Taking inspiration from the Victorian era's fixation on orientalism and the cultural aestheticism movement, there's a lot to unpack in Luscombe's opulent production. Although (often to its advantage) it is not exactly a laugh a minute, Luscombe's production definitely packs a few comedic punches. Adrian Edmondson shows off his lauded comedic chops as a manic Malvolio, tricked by his underlings into believing that his mistress is in love with him. Edmondson savours every moment of Malvolio's descent into all consuming love, strutting around in some amazingly gaudy costumes and bursting delightfully into song. Olivia's tricksy household staff are brilliant as Malvolio's scheming adversaries, with Sarah Twomey in particular getting in a few surprise laughs as the ditsy Fabia. However, despite the hysterical nature of Twelfth Night's comedic scenes, the play shines brightest during its more subdued moments. Christopher Luscombe's production justifies its effortless alteration of place and time more than adequately, bringing the text's contemplation of gender to the forefront and exploring its many intertwining relationships. Most notably, the play clearly addresses the resurgence of Greek Love in the Victorian period. When the aesthete Duke Orsino is introduced he is posturing at an easel, painting his Adonian muse, thus instantly shining a spotlight on the relationship between the sensual and artistic experiences which epitomised the movement of aestheticism. This idea is further explored through Orsino's feelings for Viola's male alter ego Cesario. 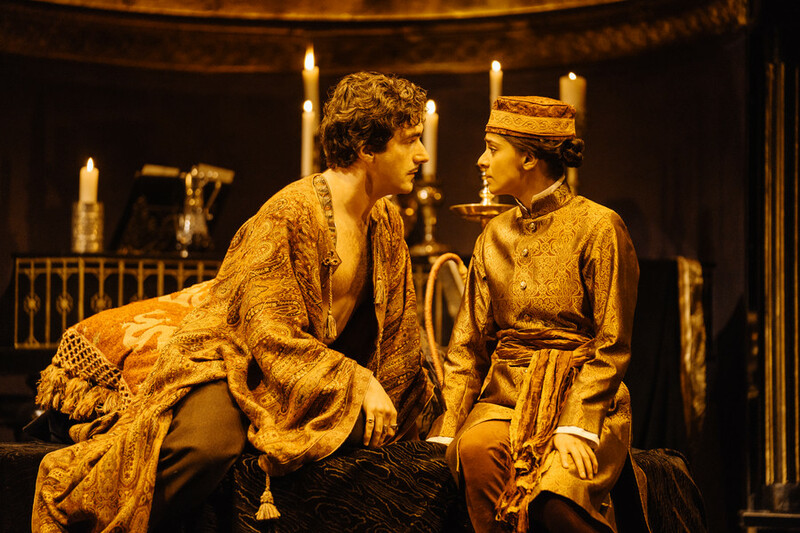 In one of the production's most breathtaking scenes, two share a wary yet passionate moment together, which is painfully underscored by Orsino's inner conflict. He is devoted to winning the hand of Olivia, but overcome by his feelings for his young serf. Having brought much physical comedy out of Adrian Edmondson as Malvolio and the rest of Olivia's household staff, Christopher Luscombe shows off the breadth of his directorial talent in Viola and Orsino's scenes, with Nicholas Bishop and Dinita Gohil beautifully portraying the blossoming love between servant and master. Similarly, with one look in the denouement, Kara Tointon's Olivia brings Twelfth Night's convenient happy ending into question. Not only is this Twelfth Night splendidly acted, it is also beautiful to look at. Sumptuous from the off, locations such as a smokey train station and idyllic sculpture garden complement the plot's sweeping and romantic moments, as well as it's more bizarre comedic ones. Simon Higlett's design, which took inspiration from Wolverhampton's Wightwick Manor, is simply superb, with rich wood panelling giving Olivia's home a sombre yet lush appearance. Orsino's domain is equally handsome, adorned with rich golden ornamentation. If the play wasn't such an iconic Shakespearean comedy, it'd be easy to attribute Christopher Luscombe's production of Twelfth Night to a certain Irish playwright from the 1890s. With plenty of Wildean wit and the prominent themes of gender and sexuality this production very much alludes to Oscar Wilde and his fellow fin-de-siecle aesthetes. The Company do a brilliant job of bringing the play to life within the Victorian time period, and the play's juxtaposing comedic high points and yearning lows are balanced very well. Sure, a few of the slapstick moments might outstay their welcome a little bit, and one or two scenes feel a bit static, but there's plenty of contrasting drama and lots of brilliant humour too, which ensures that the play practically never slows down. Every element comes together to create a production of Twelfth Night which is almost seamless.